Consumer Reports played nasty, little Santa’s helper by plopping a piece of chunky coal into Apple’s Christmas stocking, when denying the coveted—and expected—recommendation. Holy Moly. Over the holiday, the InterWebs exploded with stories during an otherwise, slow tech news cycle. CR found widely, or perhaps wildly, inconsistent charge-to-depletion times for MacBook Pro with Touch Bar. Uh-oh. At least the lap-hugger isn’t explodin’, like the Samsung Galaxy Note 7. B-b-b-boom! Perhaps, like me, you bought or received as present, one of these newfangled Macs. I have some questions about your experience starting with: How’s your battery life? Do you get enough from the laptop to justify the price increase over last year’s model? If you bought, or received, something else, did news about battery life affect the decision? Since we’re all sharing our deepest, innermost MacBook Pro secrets, from here I will reveal my own. I bought not one, but two. Problems with the first, but not the second, and possible remedy will be familiar to long-time Windows users. On October 27th, first day possible, I ordered a custom-configured 13.3-inch MacBook Pro from Apple Store Online: 2.9GHz Core i5 processor, 16GB RAM, 512GB SSD. The laptop replaced my early 2015 model, with 3.1GHz Core i7 chip, 16GB RAM, 256GB SSD. The Touch Bar marginally interested me. I pined for the second-generation butterfly keyboard and brighter, more color accurate display. Neither disappoints; they’re good as Christmas gold. But the battery drained in about half the time as specs stated; more like four to five hours rather than eight to 10. I worried that Apple’s contracted Chinese factory had produced a defective unit. I received the laptop on November 15th, and no one was talking about a universal battery crisis then. You know, BatteryGate. I made three different trips to the local Apple Store to discuss options. One sales specialist suggested that, with manager’s approval, I possibly could go beyond the normal exchange period. The company had set a more generous return window, from mid-November to early January; my laptop delivered late enough to qualify. However, counting from order date, rather than delivery, timeframe closed too soon. As my presumed, earlier deadline approached, I considered either the 15.4-nch MacBook Pro or Microsoft Surface Book. The Apple laptop’s quad-core i7 processor and discreet graphics tempted, while the larger size disinterested. On November 26th, the local Apple Store, Otay Ranch, and none other, had both configs in stock. After spending about 45 minutes with the laptop, I bought the model with 2.7GHz Core i7 processor, 16GB RAM, 2GB Radeon Pro 455 graphics, 512GB SSD. The plan: Return for refund the 13.3-inch battery bleeder, and, of course, I could do the same with with the larger laptop as late as early January, if deemed necessary. I have no complaints about the 15.4-inch MacBook Pro with Touch Bar’s battery life, which easily gets through a work day—even with demanding tasks. The laptop is speedy, the keyboard a joy, and the screen delightful. That said, there are performance hiccups that remind of any older Windows version. The computer has locked up, requiring restart, three times during the past two weeks. On my older MBP, that was a never-occurrence, which is why I recall the count clearly. 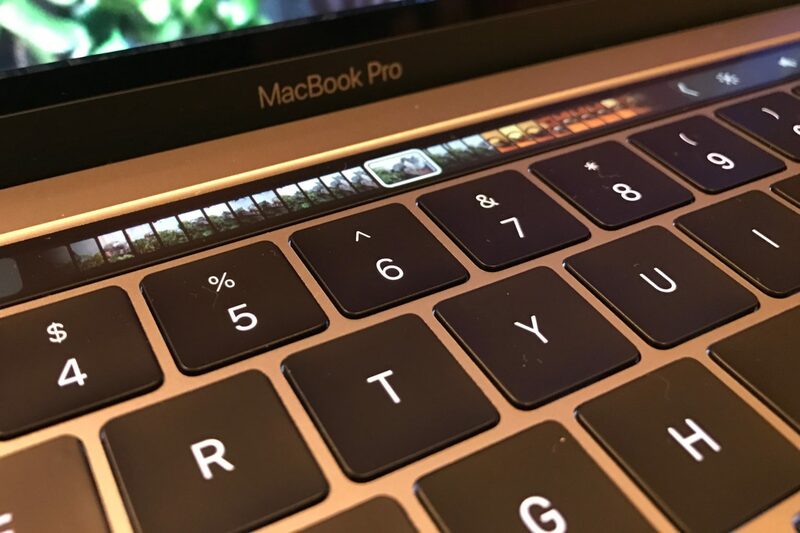 Each time, Touch Bar prevented Esc key functioning or access to Activity Monitor and possible killing an errant app rather than shutting down and restarting. Another annoyance, but arguably nitpicky: Lifting the lid doesn’t immediately wake up the notebook. Noticeable seconds pass, before the screen lights slowly but smoothly—think fluorescent rather than incandescent behavior, but accelerated time, obviously. There is something about both glitches that feels familiar to my mid-1990s experience with Windows NT 4, which moved graphics outside the kernel and sometimes crashed or bogged because of the architectural change. Neither of the ailments are apparent on the 13.3-inch MBP, which doesn’t pack discreet graphics chip. The state of the other laptop is surprising now. With a couple days left to return, I wiped the SSD but set up for my wife—using Apple’s Migration Assistant to move applications and settings from her 2015 MBP. Shock. Shock. Battery life is way different. She blasts through the day, doing much the same as I did, without any trouble. There are some differences in apps, of course. But I wonder if reinstalling macOS Sierra solved the problem. Could the factory have installed a bad disc image? Is something reset elsewhere that resolves the problem? Gasp, Microsoft users, does that sound familiar or what? Seems like the two cures to all Windows ills were and maybe still are: Reboot or reinstall. Is this what Apple has become in the post-Steve Jobs era? Microsoft circa 1994 or 2001? I ask the questions for other reasons. Because much of the simplicity and humanizing design ethics that made appealing Apple combined hardware and software disappears a little more with each new product cycle. The fruit-logo company still produces pricey, pretty things. But if they don’t work well, what’s the point of paying more only to be rewarded with more trouble? Overall, I’m not dissatisfied with 15.4-inch MacBook Pro with Touch Bar, and my wife likes the other computer so much she kept it and we sold her older laptop. Merry Christmas, Honey! To repeat: Battery lasts longer, following the wipe and restore. She breezes through a full day’s use without exhausting the charge. But out of the box, the laptop disappointed. If it hadn’t, I likely would still use the 13-incher today. But I am so much more satisfied with the larger laptop, half-charge behavior was a good problem to endure. But for Apple, battery inconsistencies are a nightmare nurturing. In business, perception is everything, and damaged brands don’t quickly recover. Galaxy Note 7 is a fresh catastrophe clinging to the cultural consciousness. The Cupertino, Calif.-based company doesn’t want to be associated with battery problems; not now, in the wake of exploding smartphones and a flagship device pulled from market about eight weeks after it launched. Galaxy Note 7 literally burned Samsung just as Apple launched iPhone 7 and 7 Plus, giving great sales lift. But what if MacBook Pro with Touch Bar gives the South Korean electronics giant the last laugh. Reviewers rave about Samsung’s super-light Notebook 9. Mmmm, when does that return date close again on my MacBook Pro? Hehe.